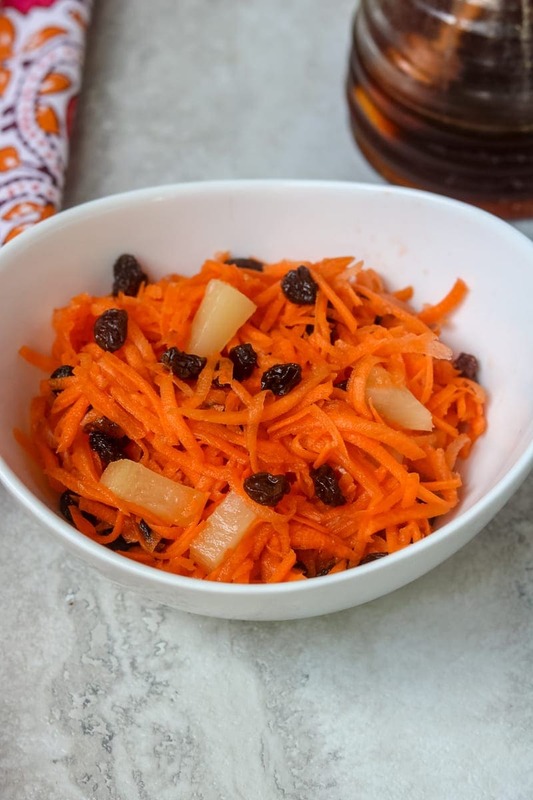 Carrot and Raisin Salad: Shredded carrots, raisins and pineapple are tossed together with a sweet and tangy dressing. This easy carrot salad is a refreshing side dish perfect for encouraging picky eaters to eat their veggies. So my son got braces this past week. And I am struggling—I mean how do I have a child old enough to have braces?!!! I also have been at a bit of a loss regarding his diet. No more homemade popcorn, no more raw carrots, no more whole apples, no tortilla chips on Taco Salad, and no nuts–thankfully ground up nuts in homemade apple pie larabars are fine. You see, my son LOVES raw carrots. And HATES cooked carrots. Carrot slices were a go-to veggie choice for his school lunches. But no more carrot slices now. And before you go and tell me that your child with braces can eat carrot slices just fine–let me tell you that my son is a rule follower and that list of no-nos from the orthodonist will be followed by him. Which yay for no more sticky candy, BOO for carrots! But then it dawned on after my son asked if I could start shredded carrots for tossed salads with ranch dressing, that I could make him a sweet and tangy shredded carrot salad and he would be able to eat it and enjoy it, braces and all. Carrot and raisin salad has been around for decades, but is was never introduced to me until I saw it on the menu at Chic-Fil-A. And truthfully, I was disgusted–but I am not much of a mayo person so the thought of carrots an raisins tossed with mayonnaise and sugar grossed me out. 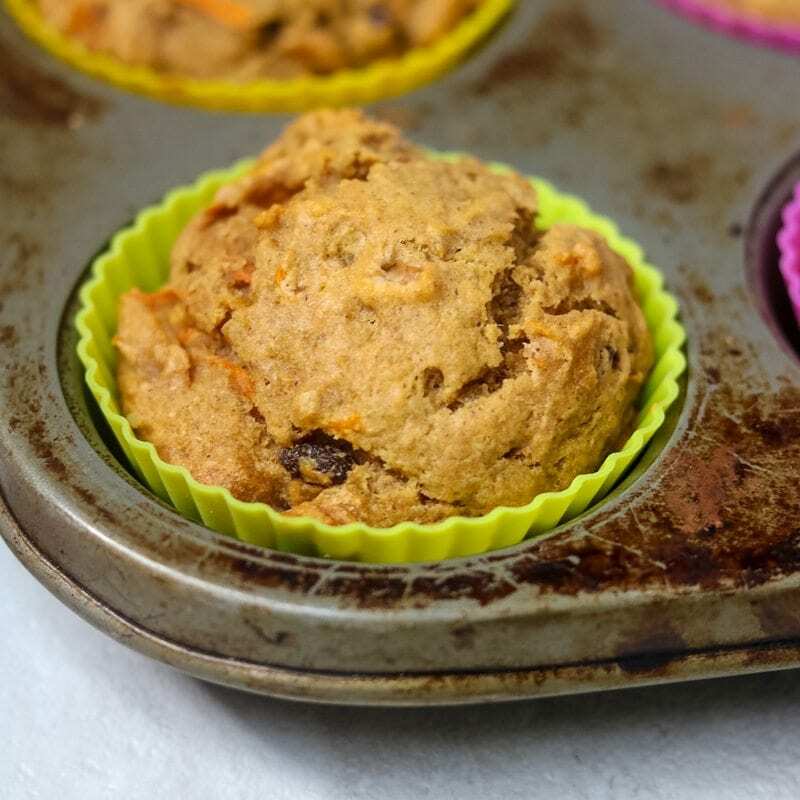 But I did like the idea of carrots with raisins and pineapple–hello carrot cake muffins! 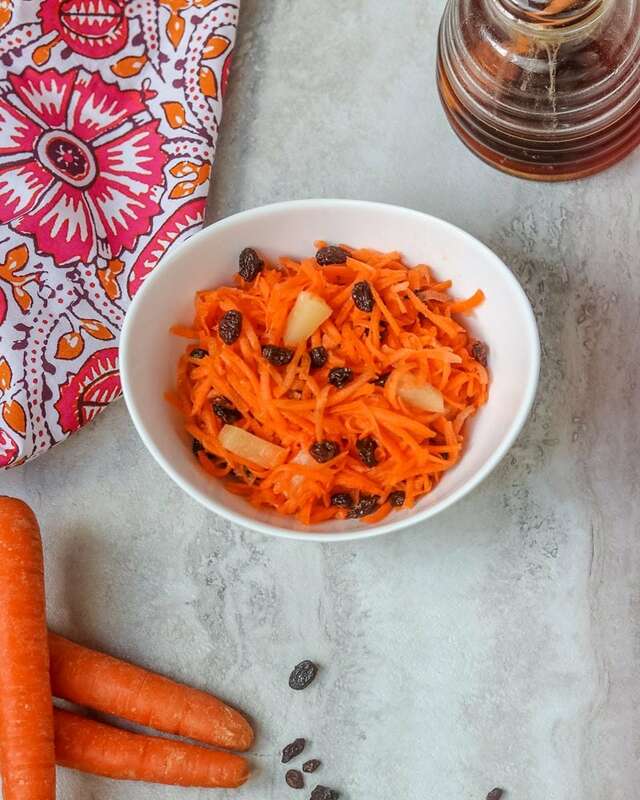 So why not combine shredded carrots, raisins and pineapple together with a sweet and tangy viniagrette for a Mayo Free copy-cat version of a Chic-Fil-A Carrot Salad. The carrots are naturally sweet and of course pair perfectly with raisins and pineapple. But when you add a splash of vinegar and a bit of salt with some sweet pineapple juice to the mix–YUM! This carrot salad hits all the notes. Does my son love it? Yep. And he even asked to take in his lunch in place of his carrot slice–MOM WIN! Carrots and honey are a natural match, but I love maple syrup in place of honey in this salad just as much. And by using maple syrup this carrot salad would be vegan and paleo friendly. Carrot salad can be served immediately, but is best after 1 hour of refrigeration time to allow the flavors to develop. Carrot salad will last for 4-5 days refrigerated. Feel free to use golden raisins in place of traditional raisins. Be sure to use pineapple tidbits in 100% pineapple juice. If you can only find a 16 ounce can of pineapple tidbits, use the extra to make Pineapple Chipolte Rice or Pina Coladas. 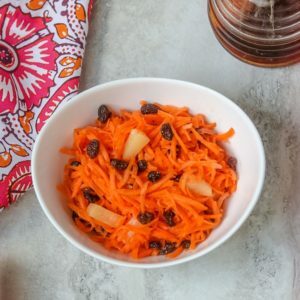 Carrot Raisin Salad makes a fabulous spring or winter salad and is a perfect side dish for Easter. Served next to Balsamic Glazed Ham, Hasselback Sweet Potatoes and Sweet and Spicy Green beans, you have a delicious Easter meal. An easy shredded carrot salad recipe made with raisins, pineapple and no mayoannaise. Mix togther the rice wine vinegar, maple syrup, salt and 2 tablespoons of the pineapple juice from the canned pineapple. Add in carrots, pineapple and raisins and toss together. 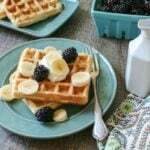 Best if refrigerated for 1-2 hours before eating, but can be served right away. 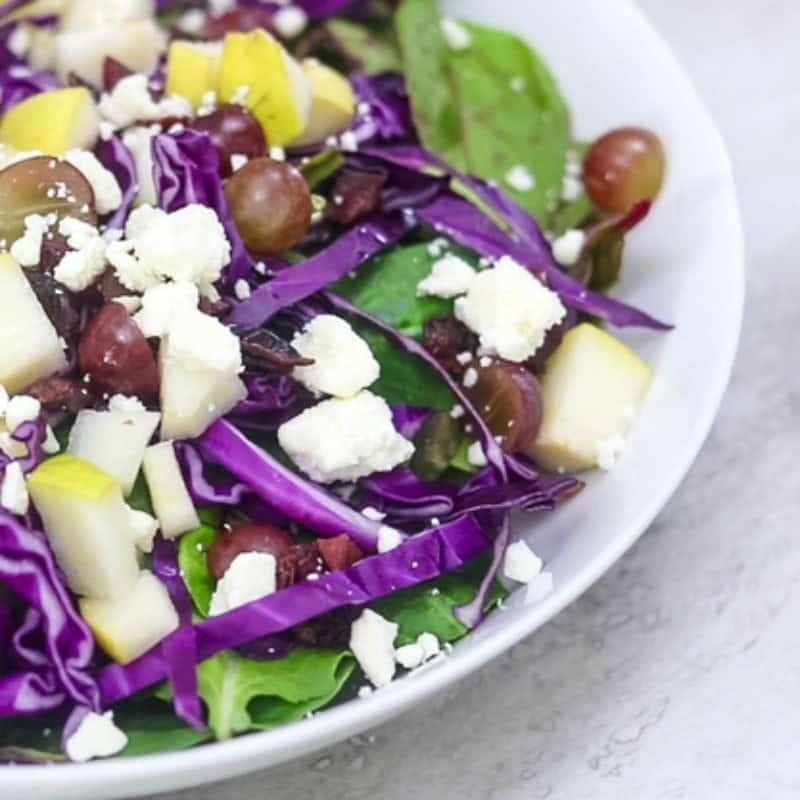 My kids just love this salad! They both love carrots but we are going through the wobbly tooth stage so they are always forgoing carrots and crunch apples because they hurt too much. YAY!!! I am so glad your kids were able to enjoy just like my son with his braces! 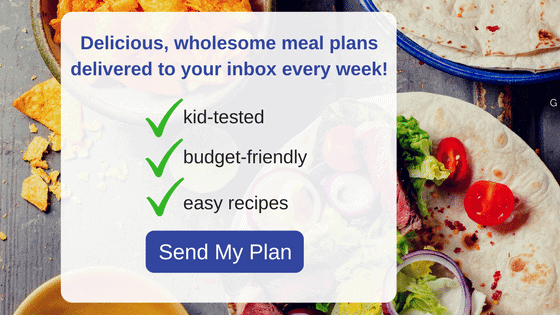 I have made this before and it’s a real winner with the entire family! It tastes like sunshine to me! I love the way you described this as “sunshine” Renee! We were so disappointed to walk into Chic-Fil-A one day, a couple years ago to find out they dropped Carrot-Raisin salad from the menu! We loved it. So, I tried my best but it just wasn’t a good replica. I’m so excited today to find your recipe that I’m preparing it as I text 😋. We’re missionaries now working in Central Africa and wanted you to know what a blessing you have been to me this morning!!! Thanks again. Hi! Great recipe. I’m babysitting and they don’t have mayo, so this was perfect. I did substitute lime for the vinegar, again because they didn’t have rice wine vinegar. I love it! Thank you, Kristen! 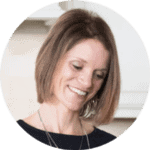 I am so glad you were able to enjoy this with what you have on hand!